House For Sale in Orpington for Offers in excess of £649,950. 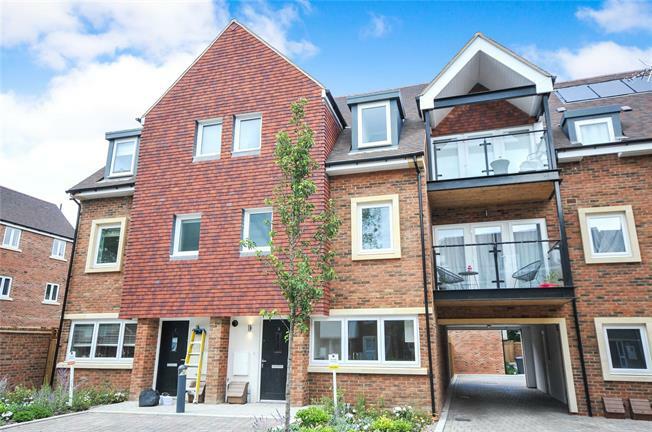 A stunning four bedroom home situated in the exclusive London Square Orpington development. Split over three floors, covering approx. 1,376 sq ft., and providing multiple options to personalise the look and feel, you can create a home that is truly yours. The well-spaced dual access kitchen/dining room includes a U shaped kitchen and a choice of designer colours in a handless design, high gloss cabinets with soft close hinges. With an extensive range of optional extras including a range of laminate worktop surfaces, integrated microwave, a dishwasher, full height splashbacks and a boiling water tap, you are able to reflect your own personal style. Double doors lead you into the spacious living room, accentuated by large windows and double doors allowing natural light floor in, leading out on to a private paved patio and garden. Dual access to the living room and kitchen/dining room offers flexibility to open out or separate rooms off. A convenient WC bathroom and additional storage space including space and plumbing for an optional washer/dryer, complete the ground floor. The master bedroom on the first floor boasts large windows and a glass door that leads out onto a private balcony that overlooks the garden. Generous space for a large wardrobe is also hosted in the master bedroom alongside an en suite, including a walk-in shower, heated towel rail and wall mounted cabinet with mirror door finish. The first floor also hosts a single bedroom with optional wardrobe space which could easily be turned into a study or playroom if relevant; the family bathroom with full sized bath, heated towel rail and wall mounted cabinet, and additional storage space, accessible off the first-floor landing. The second floor also features two double bedrooms. Bedroom two also hosts optional space for a wardrobe and a convenient en suite, with walk-in shower, heated towel rail and wall mounted cabinet with mirror door finish. Bedroom three, hosting a large feature window, optional space for a wardrobe and an additional storage area completes the second floor. The property comes with one parking space for convenience. All bedrooms have space for optional wardrobes and flooring options are available throughout the house. Located on the site of a former NHS residential campus, this prestigious development has been designed to offer tranquillity and convenience. Surrounded by mature trees, a natural pond and wildlife, London Square Orpington has excellent road and rail links direct into the capital and the south.